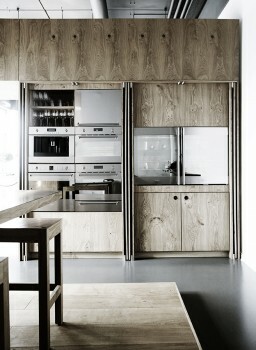 We found this custom kitchen example at KBH Københavns Møbelsnedkeri. They are a company out of Denmark that makes custom handmade furniture. This minimalist style kitchen is fully equipped with appliances. However, they can all be hidden away by closing a couple sets of doors. Any place where you have some depth allowances from the front of the wall, you can possibly incorporate doors like these. They act as normal doors, but when opened to 90 degrees, they slide back into the wall. This allows full use of the space in front of them. 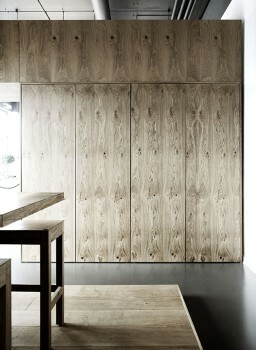 A cleanly designed door can be made to look like a modular wall panel in a modern space. Magnetic locks could easily be added to provide a more secure environment behind the doors and still leave no visible latches or locks. This same method of doors that retract into the wall could be used to hide built in display cases or gun cabinets.